antigen. Its presence is typically associated with higher rates of viral replication and therefore increased infectivity. 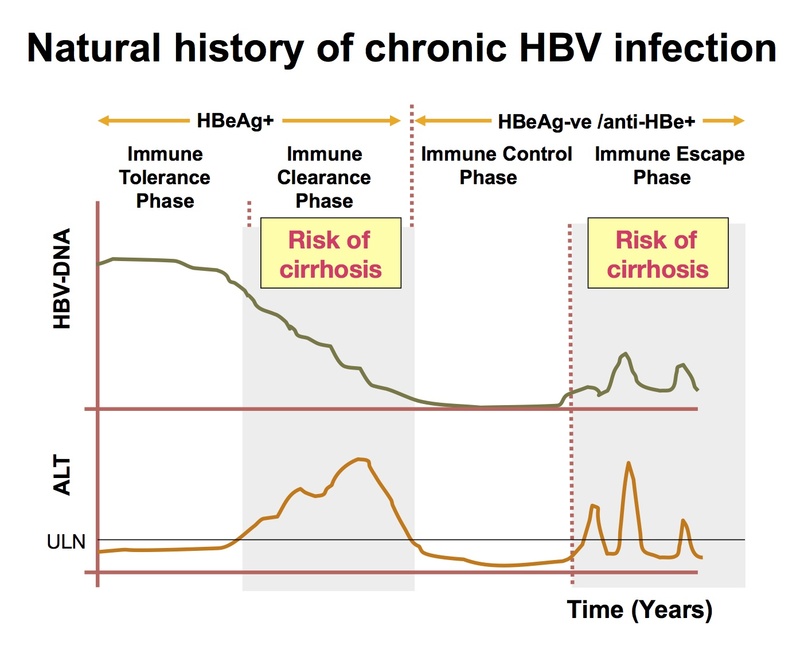 Figure 1 (see below)5 depicts the natural history of chronic HBV infection. The ‘immune tolerance phase’ is seen in HBeAg-positive disease and is characterised by high levels of HBV replication with normal alanine aminotransferase (ALT) levels and limited liver necroinflammation. This phase is commonly seen in children. It is followed by an ‘immune clearance or immune reactive phase’ in which the immune system recognises and starts to clear the virus. Alanine aminotransferase levels are typically elevated or fluctuating, and there is a higher risk of liver fibrosis. This tends to be the initial phase in people infected with HBV as adults. It lasts from weeks to years and ends with HBeAg seroconversion. With the loss of HBeAg, the person may enter an ‘immune control phase’ with very low or undetectable HBV DNA levels, normal ALT and minimal fibrosis progression; however, some people may experience rising HBV DNA levels despite HBeAg negativity. This is caused by virions that do not express HBeAg because of genetic mutations. This ‘immune escape phase’ can lead to active necroinflammation and progression of fibrosis. HbeAg=hepatitis B e antigen; Anti-HBe=hepatitis B e antigen antibody; HBV=hepatitis B virus; DNA=deoxyribonucleic acid; ALT=alanine aminotransferase; ULN=upper limit of normal of ALT. ensure people diagnosed with hepatitis B are referred to specialist care. Dr Chowhan’s article also covers the referral and assessment of pregnant women who are HBsAg positive, plus the importance of neonatal hepatitis B vaccination. The goal of treatment for chronic hepatitis B is to suppress viral replication, reducing viraemia, preventing cirrhosis, HCC, and liver failure. Since the introduction of effective antiviral treatment in the form of interferon alfa, several nucleoside and nucleotide analogues are now approved for use in adults with chronic hepatitis B, together with a pegylated form of interferon alfa. Antiviral treatment in adults with chronic hepatitis B—including treatment sequences for those with HBeAg-positive and -negative disease—can be found on NICE Pathways at: pathways.nice.org.uk/pathways/hepatitis-b-chronic. loss of HBeAg and seroconversion to HBe antibody (anti-HBe); loss of HBsAg and seroconversion to HBs antibody (anti-HBs). Liu T, Fang Y, Xiong H et al. A case-control study of the relationship between hepatitis B virus DNA level and risk of hepatocellular carcinoma in Qidong, China. World J Gastroenterol 2008; 14 (19): 3059–3063. Liaw Y, Sung J, Chow W et al. Cirrhosis Asian Lamivudine Multicentre Study Group. Lamivudine for patients with chronic hepatitis B and advanced liver disease. N Engl J Med 2004; 351 (15): 1521–1531. Chu C, Karayiannis P, Fowler M et al. Natural history of chronic hepatitis B virus infection in Taiwan: studies of hepatitis B virus DNA in serum. Hepatology 1985; 5 (3): 431–434. British Society of Gastroenterology website. Chronic management: management of patients with chronic liver diseases. www.bsg.org.uk/clinical/commissioning-report/management-of-patients-with-chronic-liver-diseases.html (accessed 22 October 2014).